Over the last year, the Century Walk Corporation has been creating a series of free audio tours to accompany their 40+ piece public art collection in Naperville, Illinois. The goal with the audio tours was to capture the most important and interesting details about each sculpture, mural, mosaic and relief in a voiceover segment that was targeted at 3 minutes or less. The next step was to make the audio tours easy to access while standing in front of each piece of art. 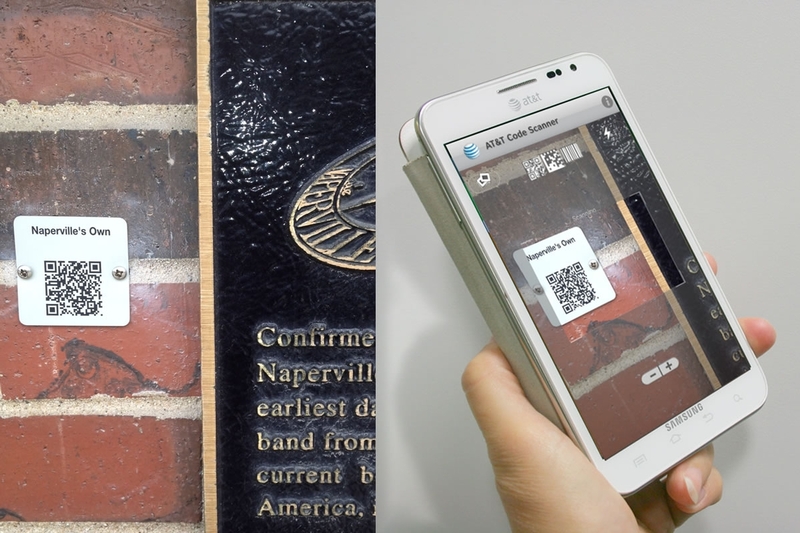 Using new QR (Quick Response) code technology, a Century Walk visitor can now scan the black and white code found in the corner of each artwork plaque with a smartphone to instantly listen to the Century Walk audio tours. Here’s how the tours work: a visitor opens his or her smartphone’s QR code reader and holds the phone’s camera 2-5” from the QR code found near each piece of art to allow the phone to scan the code. The audio tour loads automatically; and the visitor simply hits the “play” button to enjoy the tour. The audio tours, which can also be accessed via the “Audio” tab on the Century Walk mobile website (m.centurywalk.org), were compiled by Naperville residents John and Carolyn Roscich from Jini Leeds Clare’s 112 page coffee table book, Century Walk: Art Imitating History. The Roscich’s read their scripts in a recording studio and the files were posted on the Century Walk website for all to hear. There are now 40 audio tours available — one for each of the first 40 pieces of Century Walk art. All but three pieces in the Century Walk collection are clustered along two miles of sidewalk downtown Naperville. A handy, recommended walking route has been created on Google that gets you from one end of the collection to the other using the most efficient path at: http://goo.gl/maps/66qOS. The audio tour QR code plates were created and installed by local company, Imprint Enterprises (http://www.imprint-e.com ). The Century Walk websites were created by Naperville Chamber of Commerce member, 4Next Interactive (www.4-next.com ). John and Carolyn Roscich are Naperville attorneys who have long been involved with the Century Walk. The Roscichs have offices at 214-1/2 S. Washington Street, (http://www.randrattys.com/ ). For more information about the Naperville Century Walk, please contact Brand Bobosky at 34 West Chicago Ave., Suite B, Naperville, Phone: 630-355-5553. Or visit www.centurywalk.org or the Century Walk Facebook page: www.facebook.com/centurywalk. The Century Walk Corporation, founded in 1996, is a 501 (c) 3 non-profit organization dedicated to bringing public art to Naperville to add beauty to the town, build community and bridge generations through a diverse collection of murals, mosaics, sculptures, and other public arts.